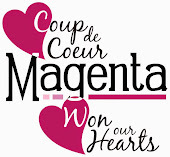 The new stamps from Magenta are SO beautiful! Les nouvelles étampes de Magenta sont SI belles! He's just adorable - and I love the colours and honeycomb in the background. Such a beautiful card!! He is so precious! Nice choice of colors and placement of objects!! Thanks for sharing! !